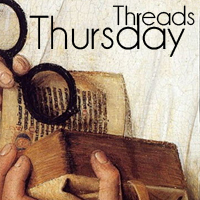 Historical Tapestry: Thursday Threads - How important is Historical Fiction? Thursday Threads - How important is Historical Fiction? When I shared my Thursday thread question with my husband he stated he thought it was a bit "deep". As an family historian I believe that historical fiction is quite important. Whilst the storyline might be completely fictional the idea has to come from somewhere. I mean no one gets up and thinks today I am going to write a novel about Tudor England unless they have an interest in the historical setting of Tudor England. Or am I wrong? I am finding that I am writing more notes than ever when I am reading historical fiction. Things occur to me and I wonder how that particular situation or scenario impacted on previous generations of my family. So, at the risk of being a bit "deep"
How important is historical fiction to you? Very important! Without historical fiction, I don't know if I would have been prompted to read into certain historical events, people or places. I am a history buff, but I honestly do not think I would be without historical fiction--it is a huge catalyst. And history itself, whether its your own family history or the larger history of a country, is important for numerous reasons! As I writer of historical fiction, I'm bound to say it's important! But all joking aside, I hated history at school. It wasn't till I was drawn into historical fiction that I began to appreciate it, and now I love reading history books. And the importance of history can't be underestimated. When we understand our past, we understand ourselves and we appreciate both the advances that have been made (in health, nutrition and technology above all) and the decline in some areas (attention span and classical learning are good candidates). So keep that historical fiction rolling in! I don't remember a time when I did not enjoy history, but well written, well researched historical fiction is a great way of bringing the past to life through identifiable characters and scenarios. I have found that it has also provided a great stepping stone into finding equally interesting historical people and reading up on them and the time and place in which they lived. The next step of writing my own historical fiction is making me realise just how much history I still don't know and want to, and how much research is necessary to make a realistic sketch.